Definition at line 7 of file region.h. Definition at line 11 of file region.h. 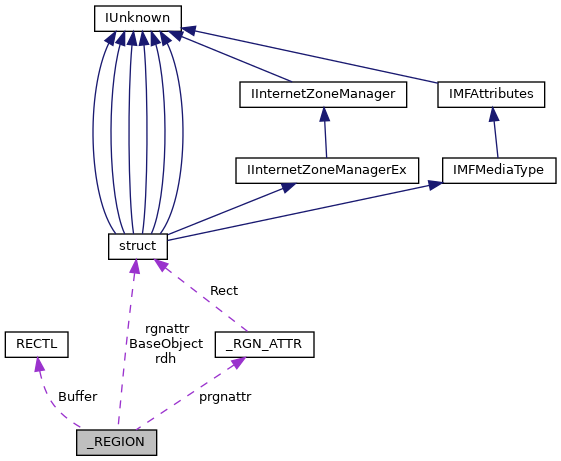 Referenced by GreCreateFrameRgn(), GreCreatePolyPolygonRgn(), IntGdiSetRegionOwner(), NtGdiCreateRectRgn(), NtGdiPathToRegion(), REGION_AllocRgnWithHandle(), REGION_bAllocRgnAttr(), REGION_Delete(), and REGION_XorRegion(). Definition at line 16 of file region.h. Referenced by _Success_(), IntEngWndUpdateClipObj(), IntGdiBitBltRgn(), IntGdiFillRgn(), IntSysCreateRectpRgn(), NtGdiEqualRgn(), REGION_AllocRgnWithHandle(), REGION_Coalesce(), REGION_CropRegion(), REGION_PtInRegion(), REGION_RectInRegion(), REGION_RegionOp(), REGION_SetExtents(), REGION_SetRectRgn(), REGION_SubtractRectFromRgn(), REGION_UnionRectWithRgn(), and REGION_vCleanup(). Definition at line 12 of file region.h. Referenced by IntGdiSetRegionOwner(), IntSysCreateRectpRgn(), REGION_AllocRgnWithHandle(), REGION_bAllocRgnAttr(), and REGION_vCleanup(). Definition at line 15 of file region.h. Referenced by _Success_(), IntEngWndUpdateClipObj(), IntGdiBitBltRgn(), IntGdiFillRgn(), IntSysCreateRectpRgn(), NtGdiEqualRgn(), REGION_AllocRgnWithHandle(), REGION_Coalesce(), REGION_Complexity(), REGION_CropRegion(), REGION_GetRgnBox(), REGION_IntersectRegion(), REGION_PtInRegion(), REGION_RectInRegion(), REGION_RegionOp(), REGION_SetExtents(), REGION_SetRectRgn(), REGION_SubtractNonO1(), REGION_SubtractO(), REGION_SubtractRectFromRgn(), REGION_SubtractRegion(), REGION_UnionNonO(), REGION_UnionRectWithRgn(), REGION_UnionRegion(), REGION_vCleanup(), and REGION_XorRegion(). Definition at line 13 of file region.h.